In Part 1 we talked about the importance of the soil, now we dig deeper into using the birds to improve the soil and meeting the nutritional needs of the chickens. After the animal impact we no longer have a sterile hard pan field, we are able to grow a very diverse cover crop to provide additional forage.. Prior to the chickens and turkeys – and now guineas, grasshoppers were a major issue in our garden. What we experienced was grasshoppers moving in from the pasture up to our garden, stripping fruit trees, and any plant of value that was in their way. It got to be a real discouragement to garden – after all who wants to grow food for grasshoppers. Now after running the chickens, turkeys, ducks, and guineas – we do not have a grasshopper problem. 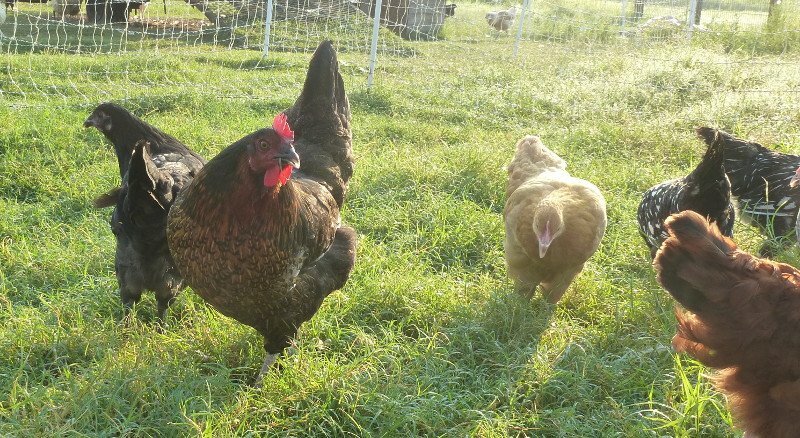 So when I think of sustainability – I don’t think first of what can I feed the chickens, I think first of what can I do to improve the life in my soil. And animal impact is a big tool. Not dispersed animals, but concentrated animal impact. Our coops are 10×20. We run 30-40 started pullets in each one and move them once a week. What looks like a lot of manure is just waiting for a little rain which will mix the manure into the soil. There the microbes take over converting the manure into humic acid and other such that the plants can uptake. The earthworm – indigenous biological earth tillers begin to aerate the ground and disperse the nutrients through out the soil. When we raise birds for meat, we move a smaller pen once a day. 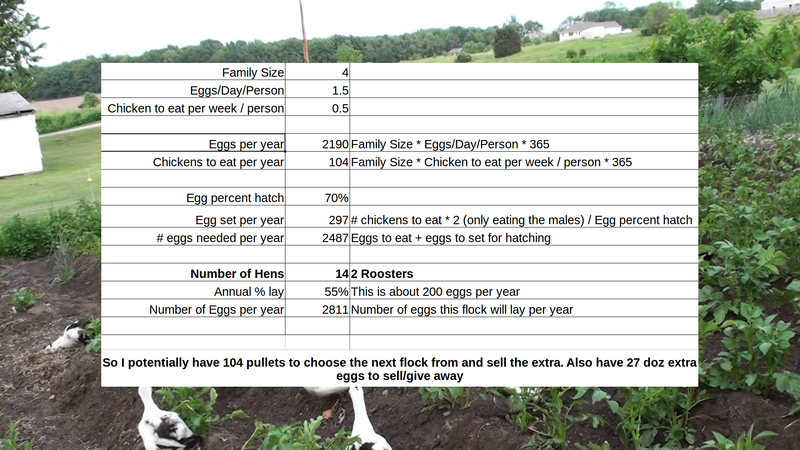 In this manner, our 1-acre field can support 300-500 chickens at one time. If I turned 500 chickens loose in the field, they would all congregate under the shade and over manure one area. By spreading them out and in effect mob grazing within the confined area, I get a more even manure distribution. 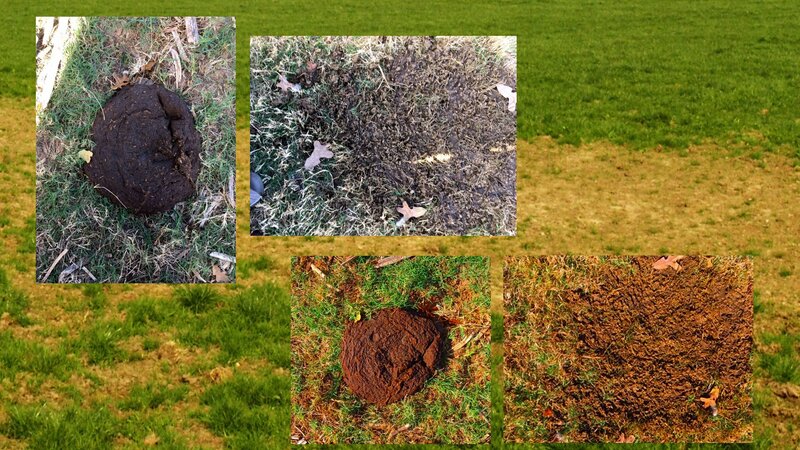 This picture shows the cow pies before and after. The dung beetles take the nutrition down into the soil, and the chickens spread out what is left. The next step will be a multi-species rotation. What we learned this year was that our 3 small standard Jerseys could not keep up with the grass. My plan is to first graze a paddock with the cows, follow them with the sheep. This will give the dung beetles time to take what manure they want down into the soil and it will give any fly eggs time to hatch and develop into larvae. Then I will run the chickens behind the sheep. 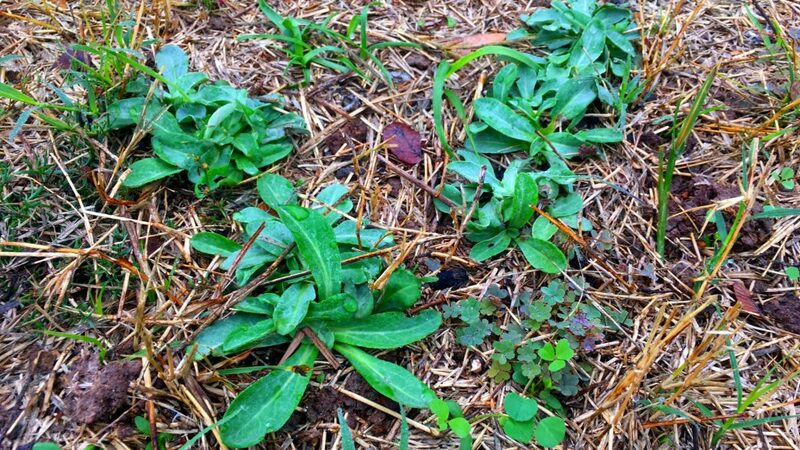 The grass will now be short enough that the chickens will be able to eat, the cow pies will provide protein – the chickens will spread out the pies and the grass will be fertilized and aerated by the scratching of the chickens – all the while increasing the organic matter and life in the soil. It is a win-win situation – instead of a crop that depletes the land, we are improving the soil and getting a crop at the same time. Second – we look at how do we augment their feed in other ways. Chickens would like a diversity of feed, they are omnivores – they eat plants, bugs, dead things, mice – basically anything that has nutrition in it they will try to eat. My goal is to be able to feed my flock with little or no off-farm or off community inputs inputs. So can I really feed my flock without purchased grain? It is possible if I pick a breed that is a good forager. Flock Size – the scale matters. Before we look at the nutritional requirements of a flock, let’s first determine what size flock we are talking about. Go through the math. I assume a family of 4, then a flock 14 hens and 2 Roosters will supply me with ½ dozen eggs per day on average and enough chickens to eat 2 chickens a week. So as we go through the feed requirements, I’m going to speak in terms of 16 chickens. Let’s look at the nutritional requirements of the chicken. What is the Chicken’s #1 nutritional requirement – WATER. How can I meet this without piped-in water? 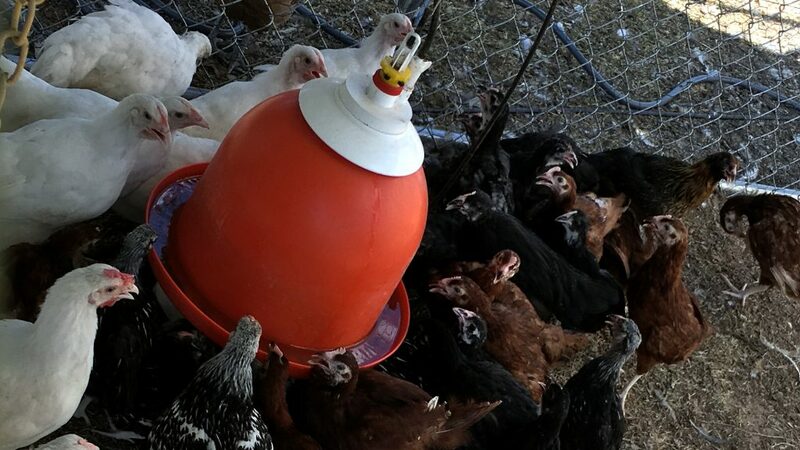 Rain water is pretty easy to do for a flock. If I allocate 1 pint per bird per day, then I need 2 gallons a day, or 730 gallons a year for our flock of 16. If I’m collecting rain water, how much surface area do I need? Here we get around 32 inches of rain a year. At 7.5 gallons per cubic foot, each sq ft of collection space will collect 20 gallons per year. So I need 274 sq ft, figure some cushion, 300 sq ft. So if I make my coop 10×10 and then cover 20 feet of the run, that would give me 300 sq ft. Water Done.